What are the system requirements of Microsoft System Center Virtual Machine Manager 2012 SP1? Today we’ll describe the system or hardware requirements for the components of System Center 2012 Service Pack 1 – Virtual Machine Manager. 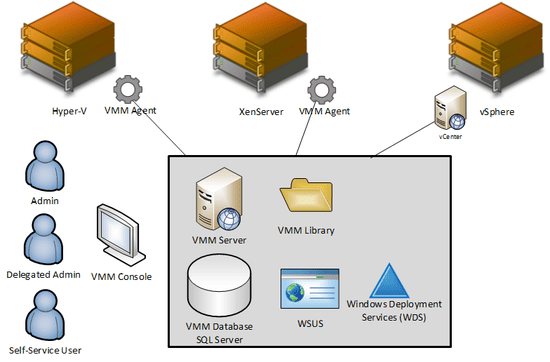 The VMM server runs a service that coordinates all the operations of VMM. This service is incredibly scalable: A basic deployment of VMM on a single server running all of the VMM roles can scale out to managing 150 hosts! The system requirements for a single VMM server are shown below in Table 1. You can see that these requirements are quite basic. As usual, “minimum” is exactly that, and anyone deploying the minimum specification should expect to perform an upgrade soon after. A variable in this specification is the amount of disk space required for the VMM Library. The classic consultant’s answer of “it depends” genuinely does apply; some smaller businesses underuse the power of the library and don’t need much disk space. On the other hand, others who make the most of the VMM library will need more disk space. Note that enabling deduplication (Windows Server 2012) on the library’s volume could give huge space savings over time. Table 1: System Requirements for a single VMM server. VMM does not have to be installed on a physical server – it can run in virtual machine. If running as a virtual machine, you have to ask yourself if you want VMM to manage the infrastructure on which it is running (chicken and egg). Some organizations choose to install all systems management components on dedicated hosts/clusters. This allows those systems management solutions to manage other virtualization farms and clouds without creating a loopback dependency. If you install VMM in a virtual machine, then make sure you deploy a sufficient number of virtual processors – remember, one virtual processer equals just one logical processor (core or Hyperthread) on a host. If using Dynamic Memory, then use a version of SQL Server that can use this memory optimization, such as SQL Server 2008 R2 Enterprise or SQL Server 2012 Standard, with a Startup RAM setting of 2 GB. VMM can scale out to manage huge clouds with more than 150 hosts. This design requires that the VMM server runs just the VMM service. Other roles, such as the database and the library, are placed on other servers or clusters. Table 2: System Requirements for scalable VMM server. It is possible to make the VMM service (2012 and 2012 SP1) highly available using an active/passive Windows Server Failover Cluster. This would be very important in service driven organization such as a cloud. The servers that will be the cluster nodes should have two network connections for fault tolerant cluster communications, such as the heartbeat. Networking and configuring (static IP address and administrator credentials) the BMCs in your Hyper-V hosts (current and future) is strongly recommended. VMM can make use of the BMC to deploy Hyper-V to bare metal hosts and to perform a power saving feature called Power Optimization (shutdown and power up idle hosts coordinated with VM Live Migration).